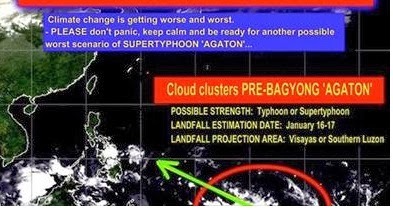 Breaking News: Another super typhoon Agaton will hit Visayas and Luzon in Philippines possibly on January 16-17, 2014. Rumors said that this typhoon is as strong as super typhoon Yolanda. But weather specialists said that this news is not true. The news became viral and popular in social networking websites. According to reports that estimated landfall is on January 16-17, 2014 and landfall projection area is in Visayas or Southern Luzon. This News and Rumor is not TRUE and has not been VERIFIED by PAG-ASA. Do Not Panic.